Trios. Seems that's the lucky number. 3 of a kind. Three's the charm. So why knit just one sweater? There's no luck in that. And March is the month of luck. So here's to my having the luck 'o the Irish as I set forth in my knitting tale of 3 sweaters. Phew! The Crawl is now in the rear-view mirror, and my obligatory knitting is (for now) a thing of the past. I’ve been itching to work on a sweater, but had to discipline myself to get through the mohair and cables to finish our shop patterns. Well, I’m now free! To knit a sweater. But hey, you know me. Why knit just one. Marie Wallin’s Bressay. 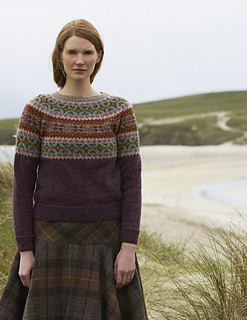 Ever since Jay and I traveled to northern Scotland, I’ve wanted to knit a Shetland sweater. So when Marie’s new book, ‘Shetland’ came out last year, I was hooked. By the very first design as I opened the book, in fact. A gorgeous yoke neck pullover, knit from the bottom up. 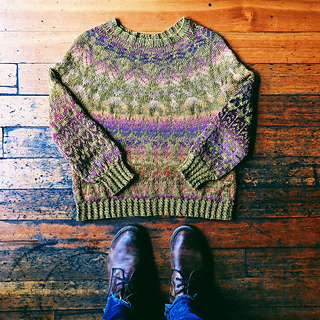 It uses Jamieson’s of Shetland Spindrift – a favorite of mine. I love the really authentic, grabby, heart of the earth yarn; if it smells like a barn and has bits and twigs in it, all the better. I’m using the exact same colors Marie used, so the body of my sweater is a lovely plummy purple. I’ve got the two sleeves complete nearly to the colorwork section. Knit on US 2s, so it’s a slow slog through the stockinette. But I’m pushing forward, so excited to be close to some color changes. Woohoo! Guthrie. Designed by Caitlin Hunter, Guthrie caught my attention the day it hit Ravelry. Colorwork without all the ends! Another pullover, this one constructed from the top down. And not just a yoke of color, but colorwork throughout the entire piece. So how come no ends? ‘Cause its knit with a main color and Dyed In the Wool – that amazing, slow color repeat phenom yarn from Spincycle that’s all the rage. This one is cast on and a dozen or so rounds into the yoke, so also well underway. My colors? Well, pink, of course. 'Heart Sigh' changes back and forth from shades of pink to gray. Against a cream background, this will be so me when its finished. Again on teeny, tiny needles (US 3), it’s a time consumer. Slow and steady wins the race! The Dog Walker. Number three in my trio of sweaters is a Plucky Knitter design. What an appropriate name for me, eh?! Yet again, a pullover, this time with a turtleneck. But no colorwork, and nice, big, fast needles – US 7s. OK, some of you may think 11-15 when you hear ‘big, fast needles.’ But I’m a tiny needle kinda girl, very comfortable with zero’s and one’s, so a US 7 is about as big as I go. This one is again a top-down ditty, and I have a big chunk done, well on my way to adding sleeves. Knit in yet another uber-gorgeous yarn, Woolfolk’s Tov. 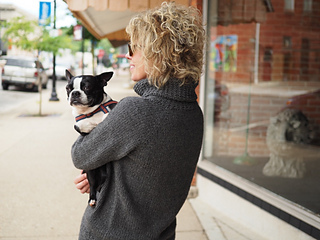 I started this sweater after buying a pair of Pendleton tartan plaid pants and needing a top to wear with them. My Dog Walker is cream colored. And an unbelievable delight to knit. The Ovis 21 Ultimate Merino is soooooo soft. I call it my dessert project. A special treat after time spent working colorwork. Easy and relaxing, buttery and creamy. Instant gratification as just a few rounds yields noticeable progress. And no calories to worry about. I love this kind of dessert! Of course, there’ll be distractions along the way, including other sweater designs to entice me – have you seen the cover of the new Pom Pom Quarterly? But I’m hoping to end the year – or maybe even start the fall – with a trio of new sweaters to keep me warm and stylin’. Wish me luck!